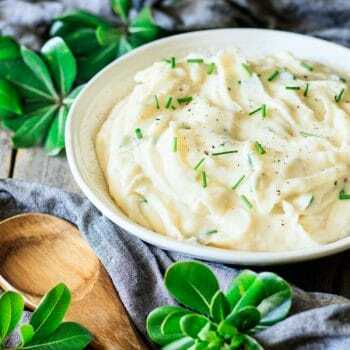 Best sour cream mashed potatoes is an easy homemade comfort food recipe. This make ahead Thanksgiving side dish are cheesy, creamy and buttery. 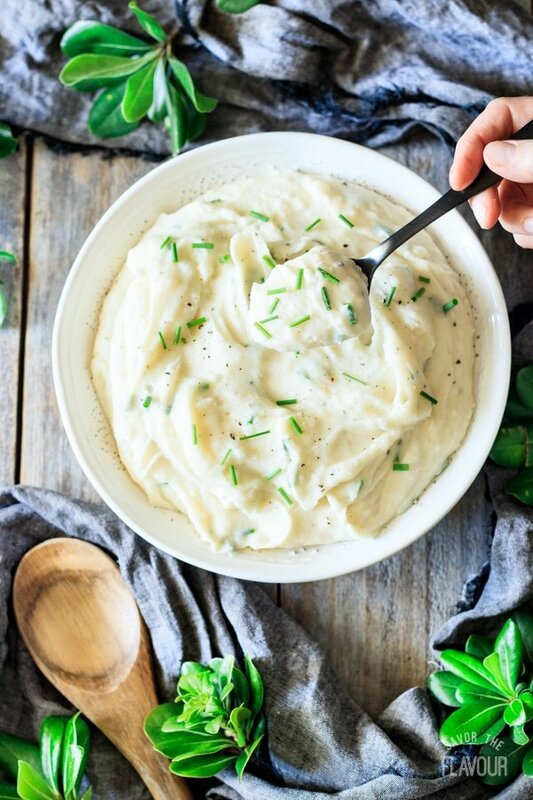 Sour cream and chives make these potatoes so tasty, you’ll want seconds! This post was originally published on September 22, 2017. 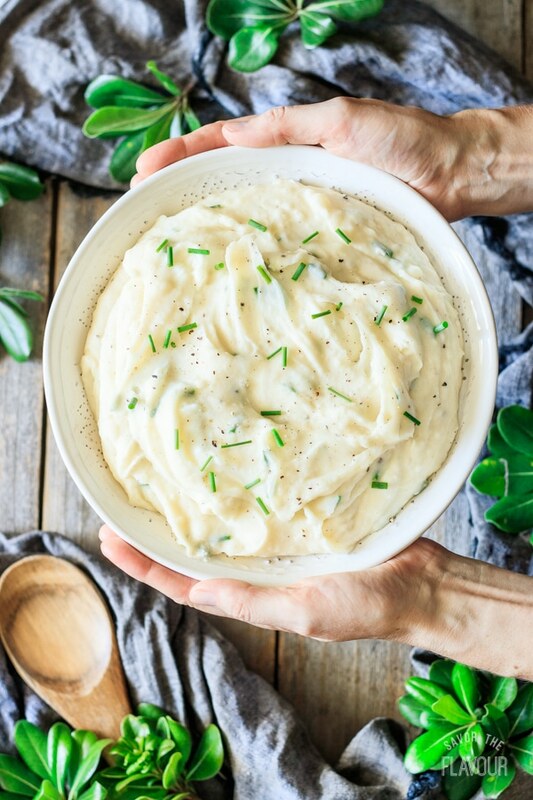 Sour cream mashed potatoes is one side dish you would be proud to serve your guests on Thanksgiving. 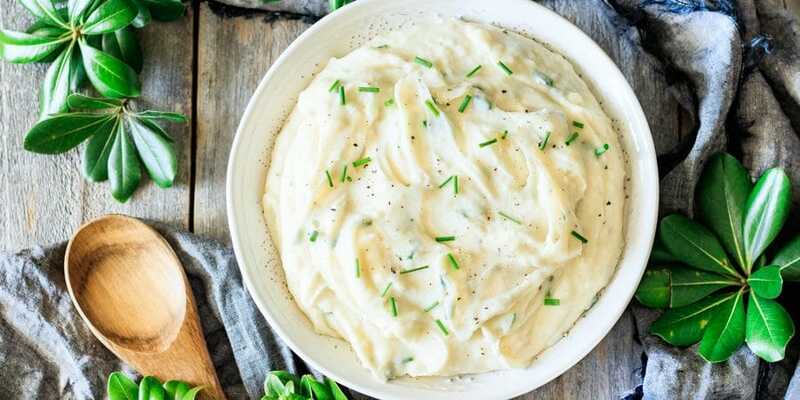 The smooth texture of this dish combined with the freshly grated Parmesan cheese and the buttermilk give these whipped potatoes a slight tangy taste which won’t be forgotten. Add in some sour cream and chives and you have a winning combination. Bookworm Beth and Artist Alex don’t like sour cream, but they’ll ask for seconds of this dish every time and that’s why I make a big batch of it. There are cheers all around when the girls know I’m making this recipe. How many potatoes should you make per person for mashed potatoes? The rule of thumb is 1/3 pound if there will be lots of other dishes being served, or 1/2 pound for potato fans that insist on taking second helpings. 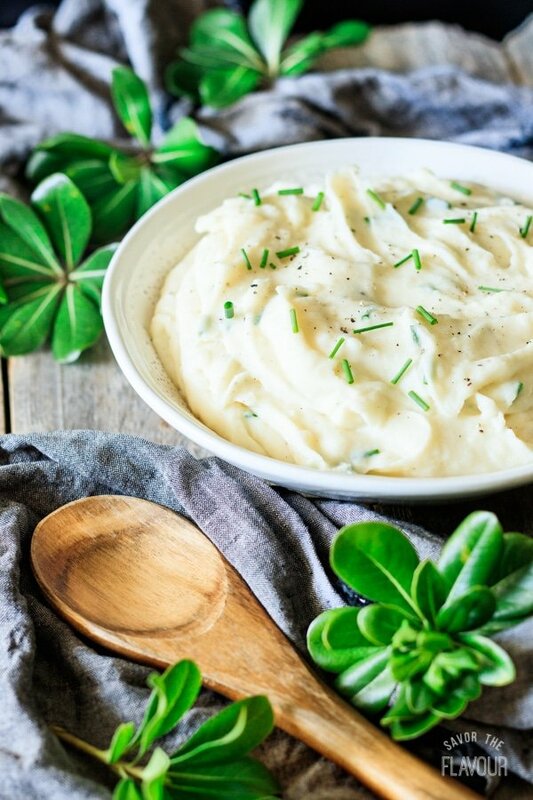 What are the best potatoes to use for mashed potatoes? Russet or Yukon Gold, which is a type of yellow potato, are the best because they are high in starch. Red or white potatoes are waxy and should be avoided and could turn to a paste. Are mashed potatoes easy to digest? 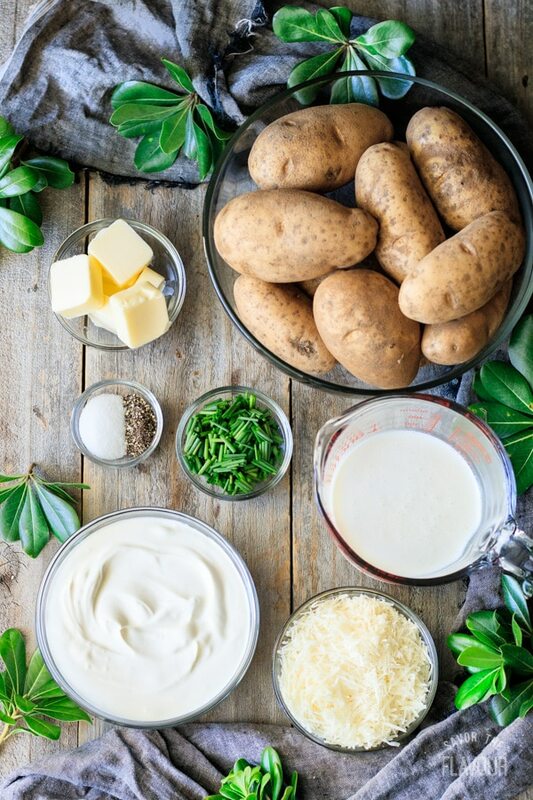 Compared to baked potatoes, mashed are easier to digest because the cooking process breaks down the starches. Gather the ingredients, then scrub, peel and cut up the potatoes. Grate the cheese, and chop up the chives. 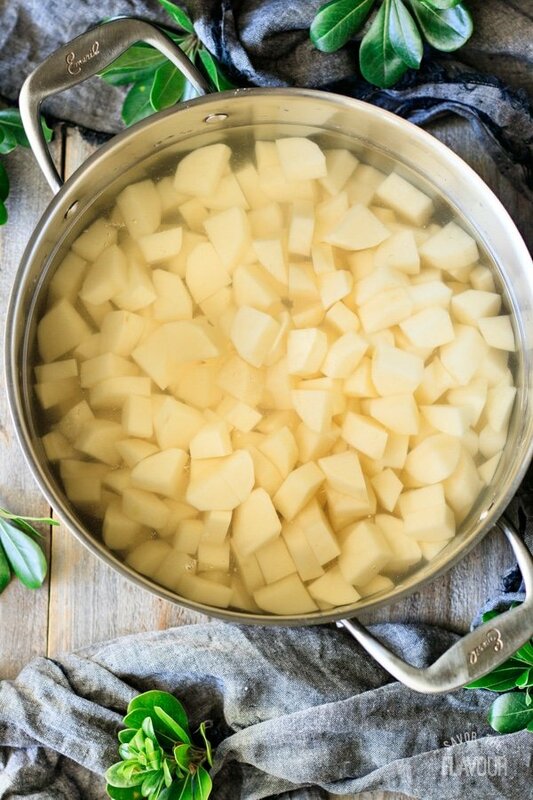 Dump in the potatoes into a large pot and cover with water. Bring to a boil, then simmer for 15 minutes or fork tender. Drain into a colander, and rinse with cold water. Transfer the cooked potatoes into the bowl of a standing mixer. Put on low speed until the potatoes are smooth, then add the rest of the ingredients. Beat on medium, then on high, until smooth and fluffy. Taste and adjust seasonings. Transfer to a serving bowl or keep warm in a crock pot. Garnish with chives and a sprinkle of cheese and cracked black pepper. Want a healthier dish? Use low fat cheese, sour cream, and milk. Put the potatoes in cold water and bring the pot to a boil. Make sure the potatoes are fork tender or they will be lumpy when whipped. 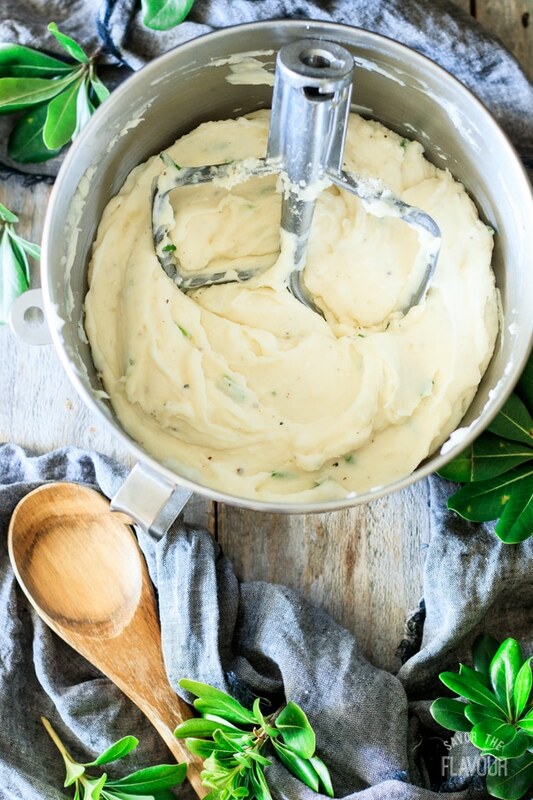 Use a standing mixer to whip the potatoes to make them fluffy. Taste and adjust seasonings. Add more butter, sour cream, or buttermilk as needed. Make ahead and keep in a crock pot on the warm setting. A dear friend once joked that she never met a potato she didn’t like. Maybe you feel the same way, but even if you’re not a meat and potatoes person, you will be glad you gave this recipe a try, especially on a special holiday like Thanksgiving or Christmas. These other Thanksgiving classics will taste wonderful with mashed potatoes. The Best Homemade Giblet Gravy: an old fashioned gravy that will take your turkey to the next level. How to Cook a Turkey: the easy way to get a moist, beautiful turkey for the big day. Grandma’s Turkey Stuffing: giblet, mushrooms, and French bread make this stuffing a real treat. Make our day by leaving a recipe rating below! 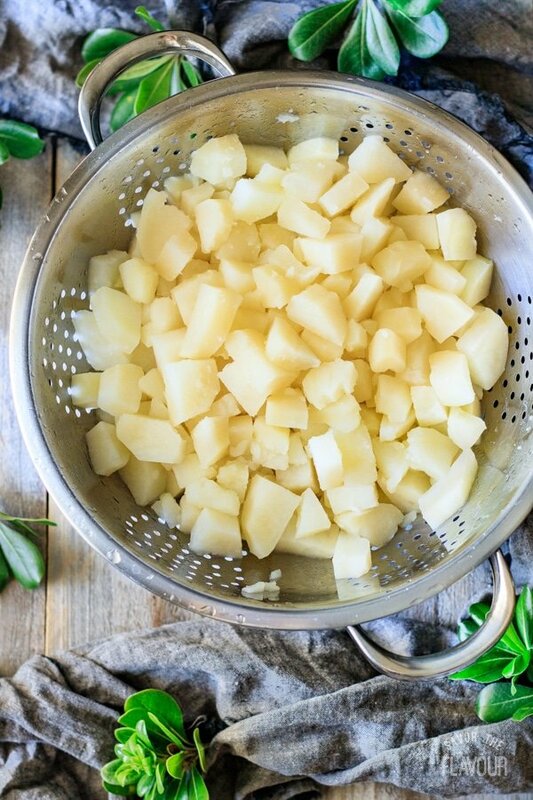 Wash and peel the potatoes, then cut them into bite-sized chunks and place in a large pot of water. Bring the potatoes to a boil, then simmer until fork tender, about 15 minutes. Drain and rinse them with cold water. Dump the potatoes into the bowl of a stand mixer and stir on low speed until smooth. Add the buttermilk, butter, sour cream, cheese, salt, and pepper into the bowl, mixing until evenly blended. Beat the potatoes on medium, then high speed until smooth. If the potatoes are too thick, add more sour cream or buttermilk to get the desired consistency. Stir in most of the chopped chives. Garnish with cracked pepper, grated or shaved cheese, and the reserved chopped chives. Serve warm. Make sure the potatoes are fork tender, or the whipped potatoes will be lumpy. Keep the potatoes warm in a crockpot set on “warm.” If you’re planning on keeping the potatoes in the crockpot for a few hours, add additional sour cream or buttermilk, as the potatoes will dry out from the heat of the slow cooker over time. 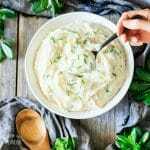 So glad that you are trying the giblet gravy and sour cream mashed potatoes recipes! Please share how it turned out. I also will be roasting a turkey tomorrow and making giblet gravy!